An annual Congress of the International Academy Laser Medicine and Surgery, called Laser Florence 2011, opened a window on four different sector of laser use on human body: skin, nervous system, teeth and cellular level. Launched as a global conference format to overcome the fragmentation of the scientific and engineering community working in the general field of ultrasonics. This book covers topics from fundamental physical aspects through chemical, biological, medical, material inspections and others branches to many applications. Constitutes the TACC-2012 conference will be held at the University of Pavia, Italy, from 2 to 7 September, 2012. Brought together experts from various disciplines to discuss how to produce electronic olfaction systems that either mimic nature or rely on novel concepts to sensing chemicals in complex odor environments. Applications of these devices are found in medicine, safety and quality control. 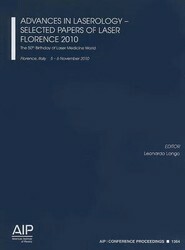 Laser Florence 2010 is the annual Congress of the International Academy Laser Medicine and Surgery. A special session was dedicated to the role of laser beams and light in Energetic Medicine, now called Quantum Medicine and Regenerative Medicine. Includes number of presentations on the development and use of detectors for nuclear applications, particularly in the area of nuclear-based interrogation and nuclear safeguards.